CASH is KING : Johnny Cash Tribute Show at Country Sunday Concert Series in Parker Press Park in Woodbridge, New Jersey Sunday July 22nd 400 Rahway Ave Woodbridge, NJ 07095 Gates Open at 5:00 pm Concert Starts 6:00 pm Jackson Video https://www.youtube.com/watch?v=_cOk-TsslMI Electronic Press Kit: https://www.presskit.to/CashIsKing LinkedIn: www.linkedin.com/pub/cash-is-king/80/1a5/463 Facebook: https://www.facebook.com/CashIsKingJonnhyCashTributeShow Twitter: https://twitter.com/CashIsKing_Band Join Cash Is King Sunday July 22nd at beautiful Parker Press Park as the scent of delicious food wafts over the park and the sounds of Cash Is King fill the air !! 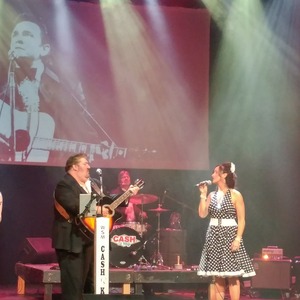 Legendary country rebel Johnny Cash comes to life in the re-creation show ʺCash Is Kingʺ. With a career spanning half a century and countless hits, including ʺFolsom Prison Blues,ʺ ʺI Walk the Lineʺ and ʺRing of Fire,ʺ and the list goes on. Now you can experience the father of Outlaw Country as he was in his prime, from his Sun Records days to his historic concert at Folsom Prison. Singer Brian Chicoine captures Cash's trademark baritone, while his band delivers the infectious, driving rhythm of the Tennessee Three. Last but far from least is June Carter portrayed by Vicky St. Pierre, who performs the classic duets complete with the sass and style of Johnny's wife ! With period costumes, cover versions of Cash classics and between-song banter, Cash Is King is the True Johnny Cash Experience. Bring your chair or blanket, your favorite gal or guy (or the whole darn family!) for an evening of twang flavored music! Bring your supper or enjoy Benson’s BBQ or other food vendors. Grab a draft beer, or a glass of wine at the beer kiosk. Prefer to bring your own supper ? No problem, but due to ABC laws, please leave your adult beverages at home. You’ll find plenty of free parking in front of the park, or at the train station behind it. Prefer mass transit? Grab an NJ Transit train or bus. The park is located at 400 Rahway Avenue, Woodbridge, NJ. Look like rain? Call the inclement weather hotline 732-602-6045. When possible, we’ll move indoors to a nearby air-conditioned venue.